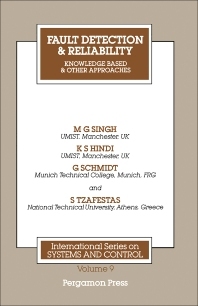 (partial) Knowledge based systems: a survey of expert systems for equipment maintenance and diagnostics, W T Scherer & C C White, III. Application of AI techniques in CAR environments, P Camurati et al. Fault detection of technological systems: critical assessment of various leak detection techniques for gas pipeline networks, G Lappus & G Schmidt. Fault detection in an evaporator via parameter estimation in real time, D T Dalle Molle & D M Himmelblau. Component failure detection using local second-order observers, D Hengy & P M Frank. Robust, fault-tolerant and intelligent controllers: towards a global approach for the design of reliable control systems, M Mariton & P Bertrand. Optimization control and reliablity of steel grinding process, R Pasquino. Fault tolerant digital techniques: VLSI wafers and boards diagnostics using multisignature analysis, A Hlawiczka. Transient fault tolerance in microprocessor controllers, J Sonnowski. Systems architectures and reliability statistics, D E Ventzas. 500 lit. refs. approx., 100 illus. approx. Provides an up-to-date review of the latest developments in system reliability maintenance, fault detection and fault-tolerant design techniques. Topics covered include reliability analysis and optimization, maintenance control policies, fault detection techniques, fault-tolerant systems, reliable controllers and robustness, knowledge based approaches and decision support systems. There are further applications papers on process control, robotics, manufacturing systems, communications and power systems. Contains 36 papers. For systems, automation and control engineers.